- Kansas is an American rock band that became popular in the 1970s initially on album-oriented rock charts and later with hit singles such as "Carry On Wayward Son" and "Dust in the Wind". The band has produced eight gold albums, three multi-platinum albums (Leftoverture, Point of Know Return, The Best of Kansas), one platinum live album (Two for the Show) and a million-selling single, "Dust in the Wind". Kansas appeared on the Billboard charts for over 200 weeks throughout the 1970s and 1980s and played to sold-out arenas and stadiums throughout North America, Europe and Japan. "Carry On Wayward Son" was the second-most-played track on US classic rock radio in 1995 and No. 1 in 1997. In 1969 Lynn Meredith, Don Montre, Dan Wright and Kerry Livgren (guitars, keyboards, synthesizers) were performing in a band called The Reasons Why in their hometown of Topeka, Kansas. After changing the band's name to Saratoga, they started playing Livgren's original material with Scott Kessler playing bass and Zeke Lowe on drums. In 1970 they changed the band's name to Kansas and merged with members of rival Topeka progressive rock group White Clover. White Clover members Dave Hope (bass) and Phil Ehart (drums, percussion) joined with Livgren, vocalists Meredith and Greg Allen, keyboardists Montre and Wright and saxophonist Larry Baker. This early Kansas group, which lasted until early 1971 when Ehart, Hope and some of the others left to re-form White Clover, is sometimes referred to as Kansas I.
Ehart was replaced by Zeke Lowe and later Brad Schulz, Hope was replaced by Rod Mikinski on bass, and Baker was replaced by John Bolton on saxophone and flute. (This lineup is sometimes referred to as Kansas II, and 30 years later would re-form under the name Proto-Kaw). In 1972, after Ehart returned from England (where he had gone to look for other musicians), he and Hope once again re-formed White Clover with Robby Steinhardt (vocals, violin, viola, cello), Steve Walsh (vocals, keyboards, synthesizers, percussion) and Rich Williams (guitars). In early 1973 they recruited Livgren from the second Kansas group, which then folded. Eventually they received a recording contract with Don Kirshner's eponymous label, after Kirshner's assistant, Wally Gold, heard one of their demo tapes and came out to check out the band at one of their local gigs in March 1973. 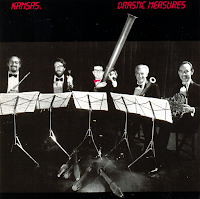 After signing with Kirshner, the group decided to adopt the Kansas name. Their self-titled debut album, produced by Gold, was released in March 1974, nearly a year after it was recorded in New York. It defined the band's signature sound, a mix of American-style boogie rock and complex, symphonic arrangements with changing time signatures. Steinhardt's violin was a distinctive element of the group's sound, being defined more by heartland rock than the jazz and classical influences which most progressive rock violinists followed. The band slowly developed a cult following, due to promotion by Kirshner and extensive touring for the debut album and its two follow-ups, Song for America (February 1975) and Masque (October 1975). Song for America was co-produced by Wally Gold and their former White Clover bandmate Jeff Glixman, who would go on to produce all of their albums from Masque to Two for the Show (October 1978) on his own, returning to the helm for 1995's Freaks of Nature. Both Masque and their next release, Leftoverture, were recorded at a studio in the middle of the Louisiana Bayou named Studio in the Country. Kansas released its fourth album, Leftoverture, in October 1976, which produced a hit single, "Carry On Wayward Son", in 1977. The follow-up, Point of Know Return, recorded at Studio in the Country and Woodland Sound in Nashville and released in October 1977, featured the title track and "Dust in the Wind", both hit singles. Leftoverture was a breakthrough for the band, hitting No. 5 on Billboard's pop album chart. Point of Know Return peaked even higher, at No. 4. Leftoverture and Point each sold over four million copies in the U.S. Both "Carry On Wayward Son" and "Dust in the Wind" were certified gold singles, selling over one million units each. "Dust in the Wind" was certified gold as a digital download by the RIAA in 2005, almost 30 years after selling one million copies as a single. Leftoverture was eventually certified five-times platinum by the RIAA in 2001. During this period, Kansas became a major headlining act and sold out the largest venues available to rock bands at the time, including New York's Madison Square Garden. The band documented this era in 1978 with Two for the Show, a double live album of recordings from various performances from its 1977 and 1978 tours. The band gained a solid reputation for faithful live reproduction of their studio recordings. In March 1978 Kansas was brought over to tour Europe for the very first time and later on that same year, they were named UNICEF Deputy Ambassadors of Goodwill. The follow-up studio album to Point of Know Return was Monolith (May 1979), which was self-produced. The album generated a Top 40 single in "People of the South Wind", whose title refers to the meaning of the 'Kanza' (Kaw) Native American people, after whom the state and the band are named. The album failed to garner the sales and radio airplay of its two predecessors. Nevertheless, the album eventually went platinum. Livgren's platinum award for the album is on display at the Kansas History Museum. The band toured the US for Monolith during the summer and fall of 1979 then went over to tour Japan for the first time in January 1980. Kansas' band members began to drift apart in the early 1980s. During the tour supporting Monolith, Livgren became a born-again Christian, and this was reflected in his lyrics on the next three albums, beginning with Audio-Visions (September 1980). "Hold On", a Top 40 single from that album, displayed his new-found faith. Hope soon converted to Christianity as well. This would be the final album with the original lineup (until they briefly reunited in 1999-2000), and also the last Kansas studio album to be certified gold by the RIAA. Due to creative differences over the lyrical direction of the next album, Walsh left in October 1981 to form a new band, Streets. In early 1982 Walsh was replaced by vocalist/keyboardist/guitarist John Elefante, who—unknown to Livgren and Hope at the time—was also a Christian. He was chosen from over 200 applicants, such as Sammy Hagar, Doug Pinnick, Ted Neeley (who played the title character in the movie Jesus Christ Superstar), Warren Ham (ex-Bloodrock, who would join the band on the road in 1982 adding sax, flute, harmonica, back-up vocals and extra keyboards) and Michael Gleason (who would supply keyboards and back-up vocals on the group's 1983 tour). Kansas' first album with Elefante, Vinyl Confessions, was released in June 1982. The record renewed interest in the group and generated the band's first Top 20 hit in several years, "Play the Game Tonight", which hit number 4 on Billboard's newly deployed Mainstream Rock chart. The album's mostly Christianity-based lyrics attracted a new audience. Still, sales of the album fell short of gold status. Drastic Measures followed in July 1983. For various reasons, Livgren contributed only three songs to the album. The rest were penned by the Elefante brothers (John and Dino, who later became successful producers for contemporary Christian music artists, including Sweet Comfort Band, Petra, Bride, Rick Cua and Guardian). 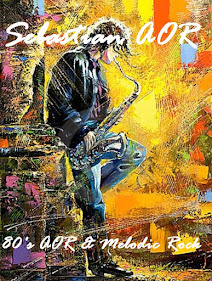 With violinist Steinhardt leaving the group before the recording sessions, the result was a more mainstream pop-rock album. Though the album charted lower than any Kansas album since Masque, peaking at number 41, its single "Fight Fire with Fire" fared better. It did not crack the Top 40 on the Billboard Hot 100, but reached No. 3 on the Billboard Mainstream Rock chart. It was the highest chart position of any Kansas release on any chart, though this particular chart did not exist prior to 1981. For their 1983 tour for Drastic Measures, Kansas was joined on stage by the aforementioned Michael Gleason and Terry Brock (who covered the absent Steinhardt's harmony vocals). During the band's time with Elefante as lead vocalist, Livgren became increasingly uncomfortable with Kansas representing his Christian worldview. After a final New Year's Eve performance on December 31, 1983, Livgren and Hope left to form AD with Warren Ham and Michael Gleason. They were joined by drummer Dennis Holt. Elefante, Ehart and Williams sought to continue as Kansas and recorded one more song, "Perfect Lover", which appeared on the retrospective The Best of Kansas (August 1984), which has sold over 4 million units in the U.S. alone. The song would eventually be removed in favor of other songs on the remastered release of the compilation. The group disbanded after its release, which thus became the final Kansas recording with Elefante. Since leaving the band, Elefante has become a popular Contemporary Christian music artist and has not performed with the group since. In March 1984 Ehart, Williams and Elefante were part of a United Service Organizations (USO) tour of US military bases that had been put together by Ehart, called 1st Airborne Rock and Roll Division, that also included Patrick Simmons (Doobie Brothers), Leon Medica (LeRoux), David Jenkins, Cory Lerios and John Pierce (from Pablo Cruise) and Robin Zander, Rick Nielsen and Bun E. Carlos (from Cheap Trick). The supergroup began four days of rehearsals in Hawaii on March 10 before beginning a 17-day tour playing for the United States Seventh Fleet in the Indian Ocean and land-based troups in Korea, Okinawa, Diego Garcia and the Philippines. This was followed by a second USO tour in March 1985 that included Ehart, Williams and Steve Walsh. In July 1985 the band came back together with Ehart, Williams and Walsh (who had briefly played keyboards on the road for Cheap Trick in the spring and summer of 1985 after the break up of Streets), but without Livgren, Hope or Steinhardt. The new lineup included Streets bassist Billy Greer and guitarist Steve Morse (formerly of the Dixie Dregs). The first performances of the new lineup with Morse and Greer took place during a third USO 1st Airborne Rock and Roll Division tour that toured US military bases in the US, Japan, Okinawa, the Philippines, Singapore, Iceland and most of Europe during the late summer through early October 1986. The re-formed band released Power in November 1986. The first single, "All I Wanted", became the last Kansas single to hit the Billboard Top 40 chart, peaking at No. 19. It also received considerable airplay on MTV. Two more singles, the title track and "Can't Cry Anymore", were less successful, "Power" hitting the lower end of the Hot 100 and getting substantial play and charting on the Rock Charts, but "Can't Cry Anymore" receiving little airplay despite a clever music video. The band added New Orleans native Greg Robert on keyboards and back-up vocals at the suggestion of LeRoux's Leon Medica. Greg played his first show with Kansas on January 31, 1987 at Roberto Clemente Stadium in Puerto Rico. The new lineup released a second album, In the Spirit of Things, in October 1988. The concept album and subsequent tour were popular with the fan base but did not receive widespread airplay beyond the "Stand Beside Me" video on MTV. Morse temporarily left the band at the end of a tour of Germany in April 1989. On September 15, 1990, Walsh, Williams and Ehart played a charity event at the Saddlerock Ranch in Malibu, California, alongside Saga, Lou Gramm (of Foreigner), Mr. Big, Eddie Money, Kevin Cronin (from REO Speedwagon) and others. Alex Lifeson joined them on stage for a short set of Kansas before Geddy Lee flew in to join Alex for a Rush set, with Ehart on drums subbing for Neil Peart. In November 1990 a German promoter arranged to reunite all the original members of Kansas (except for Steinhardt) for a European tour. Greer joined them, along with keyboardist Greg Robert. At the end of the tour, Hope left again, but Livgren remained on into 1991. 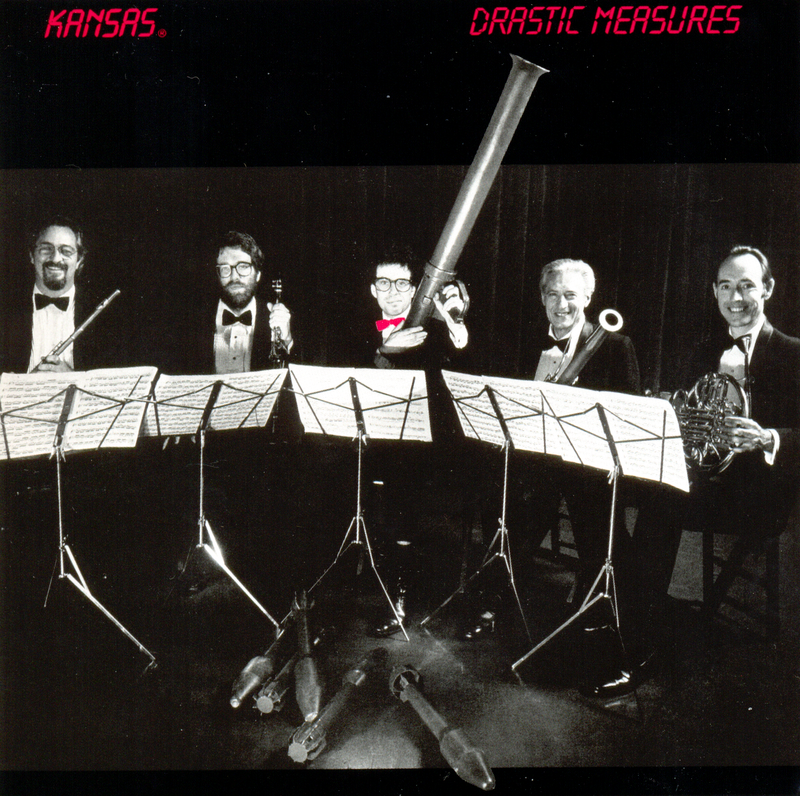 In March 1991 violinist David Ragsdale (who had submitted a tape of his playing to Ehart several years earlier) was invited to join the group and the return of the violin allowed Kansas to perform earlier material in arrangements closer to the originals. Livgren left during the 1991 summer tour, to be replaced temporarily by Steve Morse again. After the tour, Morse left the band for good to return to his own projects and eventually become a member of Deep Purple, and Ragsdale took over the extra guitar parts, leaving Williams as the primary guitar player. The resulting lineup of Ehart, Greer, Ragsdale, Robert, Walsh and Williams lasted from 1991 to 1997. This period saw one live album and accompanying video, Live at the Whisky (July 1992), and one studio album, Freaks of Nature (May 1995). During the fall of 1993, drummer Van Romaine (formerly of Blood Sweat and Tears and Steve Morse's band) came in to substitute for Ehart, who was taking care of the group's business and putting together The Kansas Boxed Set, which was released in July 1994. Bryan Holmes, from The Producers, likewise filled in for Ehart during the spring and summer of 1994 until that December, when Phil returned for a tour of Germany. On July 28, 1995 Kansas was inducted into the Rock Walk of Fame in Hollywood. In early 1997, Robert and Ragsdale left the band, and Steinhardt returned. In May 1998 Kansas released Always Never the Same, which featured Larry Baird conducting the London Symphony Orchestra. The album was a mix of older Kansas material (with new arrangements by Baird), several new songs, and a cover of "Eleanor Rigby". Somewhere to Elsewhere, a new studio album released in July 2000, featured all the original members of Kansas, plus Greer, with all songs written by Kerry Livgren. That same summer, Kansas was the opening act for Yes during their "Masterworks" tour. During the late 1990s and early 2000s, Livgren would occasionally attend Kansas shows and come on stage to play one or more songs with the band. At a March 9, 2002 concert at Lake Tahoe, he played the whole show, subbing for Rich Williams, who was "under the weather" and another live album and DVD from Kansas, entitled Device - Voice - Drum, which was recorded in the band's present home of Atlanta, was released on June 15, 2002. Also in 2002, Kansas II (the lineup prior to the recording and release of Kansas' first album) released an album under the name Proto-Kaw, featuring demos and live material recorded from 1971 to 1973. This led to a new studio album, Before Became After (2004), with most of the Kansas II members participating. Proto-Kaw released a third album, The Wait of Glory, in 2006 and their fourth and final studio album, Forth, was released in 2011, after which the band ceased. Kansas continued to tour every year. The 2006 tour was delayed for a few weeks due to Steinhardt's second departure in March and Ragsdale's subsequent return to the lineup. In 2008 the Kansas website announced that four of the five members (Ehart, Ragsdale, Williams and Greer) had formed a side recording group called Native Window, and they released their self-titled debut album in June 2009. In February 2009 Kansas recorded a concert in Topeka featuring a full symphony orchestra, with Larry Baird conducting. Morse and Livgren appeared as special guests on several songs. The performance was released on CD, DVD and Blu-ray as There's Know Place Like Home that October, and the DVD hit No. 5 on the Billboard Music Video Chart the week after its release. In July 2010 Kansas completed a 30-day "United We Rock" tour with fellow classic rock acts Styx and Foreigner. Kansas then began a collegiate tour in September 2010. On this tour, they performed with the symphony orchestras of various US colleges in an effort to raise money for the individual schools' music programs. The success of the tour led the band to start another one the following year. On September 13, 2012 Kansas began a new tour with a performance at the Best Buy Theater in New York City. Opening for them was the band King's X and a one-man-band called That 1 Guy. This tour featured many hits from the albums Leftoverture and Point of Know Return, as well as material from a number of their other albums. The band kicked off 2013 being featured on the Rock Legends II cruise. The floating rock festival for a cause aboard Royal Caribbean International's Liberty of the Seas departed January 10, 2013 from Fort Lauderdale, FL. Other big names included Foreigner, Paul Rodgers, Creedence Clearwater Revisited, Bachman & Turner, 38 Special, The Marshall Tucker Band, Blue Öyster Cult, Foghat, and Molly Hatchet. On March 1, 2013, Kansas announced a 40th anniversary celebration was in the works. "Celebrating 40 years as a band, legendary American progressive rock band Kansas is taking a break from their regular touring schedule to say 'thank you' to their legions of loyal 'Wheatheads' with a once-in-a-lifetime fan appreciation concert scheduled for August 17, 2013, in Pittsburgh, Pennsylvania", their press release read. The statement continued, "To start the concert Kansas will perform a set backed by a 35-piece symphony orchestra. Following an intermission, Kansas will then rock out a traditional band set of classics from their repertoire. The night will be highlighted by special guest appearances throughout the concert by original members Dave Hope, Kerry Livgren, and Robby Steinhardt—marking the first time all original members of the band will be on the same stage together in more than 30 years." However, Steinhardt suffered a heart attack days before the concert and was unable to participate. On July 2, 2014 a declaration was issued on the band's official Facebook page announcing the impending retirement of lead singer Steve Walsh: "On June 30, 2014, Steve Walsh informed the members of Kansas that he is resigning from the band. His last performance with Kansas will be August 16, 2014, in Sioux City, Iowa, at the Hard Rock Hotel & Casino. As Kansas continues on, the band wishes Steve only the best in his future endeavors and thanks him for the 41 years." On July 6, 2014, former Kansas lead singer John Elefante issued a statement that he had been contacted by the band on July 2 to discuss rejoining. However, on July 4, after turning to prayer, he said that it was not meant to be. At that point, he also cited Steve Walsh as one of the reasons he wanted to become a singer. A statement was issued on July 14, 2014 through the band's official Facebook page stating that Chicago area native Ronnie Platt (who had previously sung with Shooting Star) had been selected as the band's new lead vocalist and keyboard player: "Kansas would like to introduce lead vocalist and keyboardist Ronnie Platt as its newest member. Ronnie's first show with the band will be September 12 in Oklahoma City, OK, where he will take over singing duties for departing vocalist Steve Walsh." On July 24, 2014, the band announced that their longtime lighting specialist David Manion would be handling the main keyboard parts for the band on stage along with Platt, giving the group a full-time keyboardist for the first time since Greg Robert`s departure in 1997. Manion had also handled keyboard responsibilities for Kansas' bassist and vocalist Billy Greer's band, Seventh Key. In March 2015 the band released a documentary, Miracles Out of Nowhere. The documentary chronicles the band's formation and follows them throughout their success with Leftoverture and Point of Know Return. It was initially available in a limited-edition release that contained an extra DVD of bonus interviews. The documentary was released alongside a companion CD of the same name that contained a selection of the band's greatest hits along with snippets of commentary from the documentary. On September 1, 2015, a press release announced that Kansas had signed with Inside Out Music, a German label dedicated to progressive rock and related genres, for the release of their upcoming 15th studio album. The release of this album marked the longest period to date between studio releases since Kansas' previous album, Somewhere to Elsewhere, had been released over 15 years prior, in 2000. On February 26, 2016, the group officially announced The Prelude Implicit for a September 2016 release. The album's co-producer and co-writer, Zak Rizvi, was subsequently named as a full member of the band, giving Kansas a second full-time guitarist for the first time since Steve Morse's departure in 1991. On September 30, 2016, the current lineup kicked off a multi-city tour at the Benedum Center in Pittsburgh, PA, in celebration of the 40th anniversary of the release of Leftoverture, which was done again in the spring of 2017 with a twelve show 40th anniversary tour, that, like the fall jaunt, included performances of newer tracks, older songs and a complete rendering of the full Leftoverture album. A two CD set, Leftoverture Live & Beyond, was released in November 2017 that contained nineteen songs culled from different shows during the tour and the band's 2017 fall dates also included further 40th anniversary shows. Kansas' musical style, the fusion of hard rock, southern rock and progressive rock, was influenced by several previous bands. The music of Yes and Genesis was inspirational to Kansas, especially demonstrated in the lyrics of Walsh. Livgren cited the 1960s band Touch as foundational to his development. Livgren's evolving spirituality is reflected in the band's songs, with early works showing an interest in the mysticism of Eastern religions, works in the late 1970s influenced by the American spiritual philosophy of The Urantia Book, followed in the early 1980s by works embracing born-again Christianity. The re-formed band produced a harder pop metal album in the late 1980s. In a 2003 interview with The A.V. Club, Berkeley Breathed, the creator of the Opus comic strip, revealed that "Opus was named after a Kansas song." From the band's 1976 album Leftoverture, the songs "Opus Insert" and the epic "Magnum Opus" could both be the inspiration for the name. He also added, "If you're too young to know who Kansas was, to hell with you." "Carry On Wayward Son" has been covered by many artists. It was included on soundtracks for the following movies and television shows: Anchorman: The Legend of Ron Burgundy, Family Guy, Gentlemen Broncos, Happy Gilmore, Heroes (1977), Scrubs, South Park ("Guitar Queer-o" episode), King of the Hill ("My Own Private Rodeo"), Strangers with Candy ("Yes You Can't"), Supernatural (during the intro for each season finale), and Supernatural: The Anime Series (as the ending for each episode). It was also featured in the video games Grand Theft Auto V, Guitar Hero II, Guitar Hero Smash Hits, Rock Band 2, and Rock Band Unplugged. - Fusing the complexity of British prog rock with an American heartland sound representative of their name, Kansas were among the most popular bands of the late '70s, with many of their hits becoming staples of AOR radio playlists. Formed in Topeka in 1970, the founding members of the group -- guitarist Kerry Livgren, bassist Dave Hope, and drummer Phil Ehart -- first played together while in high school; with the 1971 addition of classically trained violinist Robbie Steinhardt, they changed their name to White Clover, reverting back to the Kansas moniker for good upon the 1972 arrivals of vocalist/keyboardist Steve Walsh and guitarist Richard Williams. The group spent the early part of the decade touring relentlessly and struggling for recognition; initially, their mix of boogie and prog rock baffled club patrons, but in due time they established a strong enough following to win a record deal with the Kirshner label.